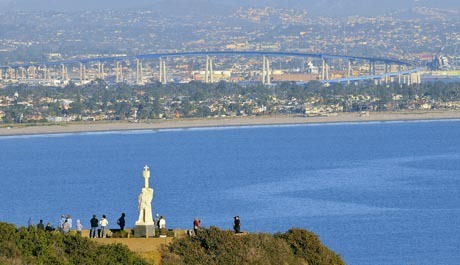 San Diego is of course home to many natural wonders, and many manmade ones as well. The Point Loma monument combines the best of both worlds, with both the natural beauty of San Diego’s beaches and the manmade beauty of the Point Loma lighthouse and other magnificent structures. The highlight of Point Loma is the Cabrillo National Monument, which is open daily to vehicular traffic, bicyclists and pedestrians. This national monument is situated at the extreme southern point of the lush green peninsula of Point Loma, stretching south from the Ocean Beach region of San Diego. The trek to Point Loma and the Cabrillo National Monument can be quite a challenging one, but the hard work in getting there will be well rewarded. It is of course the stunning views that bring so many visitors to this wonderful destination, and those views incorporate everything from the famous skyline of San Diego to the Mexican border. The western cliffs of the park surrounding Point Loma and the Cabrillo National Monument provide a uniquely wonderful view, especially in the winter months. From November through March of each year, visitors to San Diego are treated to spectacular views of the winter whale migration. This is the season when hundreds of gray whales pass by the monument on their way to their winter breeding grounds located in the Baja California region of Mexico. 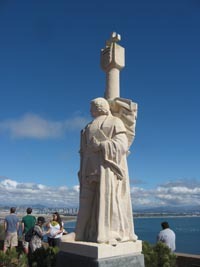 The Cabrillo National Monument at Point Loma is open every day from 9:00 a.m. until 5:15 p.m. but it remains open an extra hour during the summer months. The visibility tends to be best during the winter months, providing for even more spectacular views, but the park and the monument can be a delight throughout the entire year. Point Loma is easily accessible from interstate I-5 and I-8, and there are a number of public transportation options for getting there as well. Once inside the park there are a number of excellent and well maintained hiking trails, allowing visitors to explore the region at their leisure. With all this to see and do, from spectacular views of San Diego to spectacular views of the great whales, it is no wonder that Point Loma and the Cabrillo National Monument are such popular destinations for both San Diego residents and visitors from around the country and around the world.